There are a few fixtures that are most commonly used below we explain what they are and then you can choose which one best suits you. This is one of the most common fixtures and the most strongest, easiest to attach to the flag pole line. These are the most common fixtures, they are usually placed on the hanging side of the flag one at the top and one an the bottom. You then feed the rope though which is on the flag pole so the flag can be pulled to the top of the flag pole. These are 2 loop pieces of heavy duty rope, attached to the hanging side of the flag and used to attach the flag to the flag line of the pole. 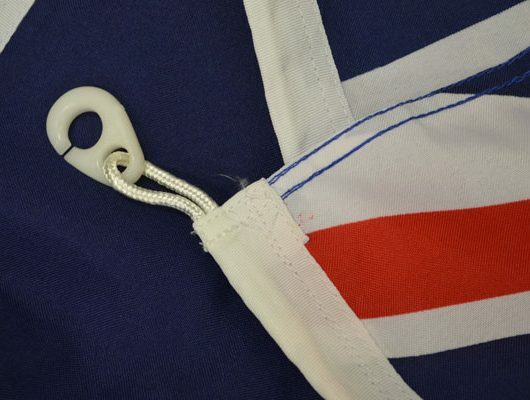 A sleeve is common for hand flags so the pole can easily slide on, the top is usually sewn to stop the flag from sliding down also we add a rope tie at the bottom so the flag can be tied to the pole to stop it from sliding off. Rope and toggle this is the attachments usually used by the military. The toggle goes into a brass loop at the top of the flag pole and the rope at the bottom of the flag ties on to the flag line to pull it taught.